Going to call him "Max the Tick Magnet" from now on. Besides getting one in my ear at 6th grade camp, I've gone 50 years without seeing a tick up close and personal. Took the puppies for a walk at Daley Ranch (Jimmy will probably know where this is). Let the puppies walk in the scrub brush on the side of the main paved trail. Big mistake. I think we're up to 20+ ticks on Max. Only found 1 on on Mika. All crawling on the surface of their fur. None imbedded in the skin. Got some Frontline (or whatever the generic Costco sells). My wife, who is more "holistic" than I am, also dusted them with Diatomaceous Earth. Last couple of ticks we found were dead. Phew... I've survived "The Great Tick Attack of 2018". Ugh, see, that's scary to me because I still wouldn't know what a tick looks like on a dog. My two are on Nexgard for fleas and ticks and it's been a miracle for me because both Kohdi and Mishka attracted fleas like you would not believe. Frontline and Advantage did nothing for them. Been hearing so many nightmare stories about ticks lately too (be sure to check their paws if you haven't already) just the other day I read about a little 5 year old girl who was bit by a tick and the next day she was unable to walk. All kinds of things that can harm our dogs out there! Kohdi and Mishka were both sick, again! with diareah that just shot out of their butts. I may have figured it out. Mushrooms! They both chew on the new grass, at first I thought maybe they were just eating too much, but then while I laid down with them on it, I noticed a bunch of teeny tiny little mushrooms popping out, so I looked up mushroom toxicity and man, some scary stuff. So now I gotta rake it everyday to knock them off, and get some sulfate of ammonium to help dry them out. My understanding is, depending on how long it's been on the dog, it will look like a large mole/ dark blister. You'd probably find them through routine petting because you'd feel them. Might find them if you notice your dog itching an area and look around to see why. As far as what they look like off the dog..... This is one we nabbed and put under a loop to get a closer look. Also dusted it with DE to see if it would actually kill it. Was still moving the next morning, but definitely looked like it was on it's last legs. I've looked up pics before, I always thought I'd actually have to see one on my dog, and have someone with experience with them, tell me it's a tick. Gotta say though, your pic is really good! I think I could actually identify one seeing this pic. Thank you for posting it. Under the skin pics I've seen a lot of and I'm pretty confident I would know that way. With the D.E. I've used that for an entire summer once, the fleas here were unbelievable and the natural route just wasn't going to work. Seriously, they were bad. I had to go out and buy Capstar just so they could sleep one night. I wanted so much to keep chemicals away from my dogs but the alternative of them getting sick from the fleas wasn't an option so I finally did the Nexgard (AdvantageII and Frontline weren't making a dent, and the house was just covered in white dust from the D.E) so I had to do it Since I wasn't confident identifying a tick so I chose a chewable that takes care of both. I haven't been to the Daley Ranch yet! What is the Rattlesnake danger like, there? There's a couple hikes up towards the Ramona area I'd like to do with Kohdi but not while the weather is warm, haha. Rattlesnakes are the one thing I'm scared of. And alligators! LOLOL, luckily we don't have those here! We've done the whole house flea thing too... not fun. I hike fair amount. I just started solo backpacking and hiking a year or so ago. Am hoping to take the dog(s) one day backpacking with me. I think they are too young still to do any more than short, easy hikes. Daley Ranch is a nice place to hike around. Gets busy. Dogs are allowed. There are poop bags and even a water dish and water available at the parking lot. Rattlesnakes are there for sure. I've seen them there a few times. Mostly on the trails farther back. One of those things you just expect. Avoid the times they come out (morning and night). Definitely not a fan. Can't say I've had any close calls, but, hiking up on Palomar Mtn, I stopped to take a picture and when I turned to start hiking again, there was a snake right in the middle of the trail. Didn't see him at all before I stopped. Ramona has nice hikes too (and rattlesnakes). Of course, very hot in the summer. I've done a few hikes out there. Last one was Cedar Creek Fall. If you don't mind the drive, head out to Santa Ysabel Preserve (EAST) and start from the EAST trail head. Neat hike. Can be as long as you want (8 mile loop) or a quick out and back. You walk through open grazing area so there are cows right on the trail and in the fields around you. Not sure how our dogs would react so I'll wait until they are better trained to take them there. I couldn't imagine not knowing the irritation of a tick bite or dealing with the little monsters. We obviously always have them bad. Regular ticks are easy to spot. Pray you never get into a batch of seed ticks. Of my three Kye attracts ticks the worst, followed by kenzi. Keno seems to be a turn off for ticks and I rarely see ticks on him. Wondering if it's not a color thing. My old black dog didn't get ticks too bad either but our light color Weimaraners would get them terribly. It doesn't help that the dogs like to walk in the tall grass. No clue why, but they gravitate to the tall stuff. Think kenzi just like the noise of it. More often on a dog, the ticks look like this = full of blood and bloated. 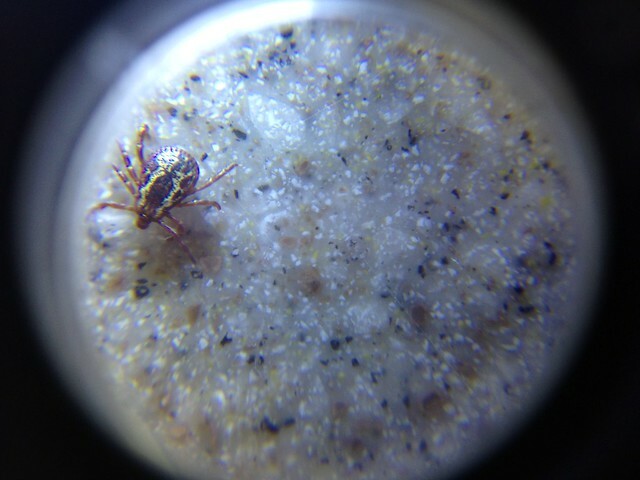 I don't have many tick problems but, here, fleas are a year around fight. I have to de-flea all of my animals, not just dogs to keep them off the dogs. Even then, if they are going off the property, they get a spray in addition to the Bravecto I give them. Mosquitoes are a big problem here, living very close to a river with swamps and a lake less than 2 miles away, those are a constant summer time problem. I have plants and, use Citronella here to ward them off the property and, we have to vaccinate for west Nile but, off property, again, a spray is needed. Jenn, funny you mentioned that with yours. Miya is a tick magnet too, assumed it was because she likes to dive in tall grass where Sofie doesn't. I have yet to see a tick on Sofie, so now I do wonder if it's their color that attracts them more. @dvflyer thanks for all that information! So far, Kohdi and I have only done Cowles Mountain and Mission trails, they're right where I live. I will wait to try new stuff til rattlesnake season is over. I don't want to be unfamiliar with an area and then something happens. @bluemoods thanks for that pic as well! My problem with pics versus encountering them in real life is, judging their actual size. Pics tend to make things appear much bigger than they actually are, and I just want to be sure I'm seeing an actual tick versus a garden insect, for example, before I freak out. I know what fleas look like because I've seen them, but if I had gone by pics, I'm not sure. Ticks aren't a big thing here, like Mosquitos , they exist here but they aren't easy to find. An empty tick is smaller than a pencil eraser but bigger than a flea. A full tick is the size of the end of your finger, roughly. I went hiking with my girl in Pennsylvania the other week and searched her up and down and found nothing. Come back to Florida to find a, what I'm pretty sure was a female deer tick, on my side. Must've been on my backpack since that was the only thing I had out there that I didn't wash. Be careful, ticks are nasty. I still hope there were none on Tetra because now I feel like I didn't find any because I just wasn't looking hard enough even though she's on Nexgard. Also don't forget to look in the paw pads because that's a super common spot for them to be! 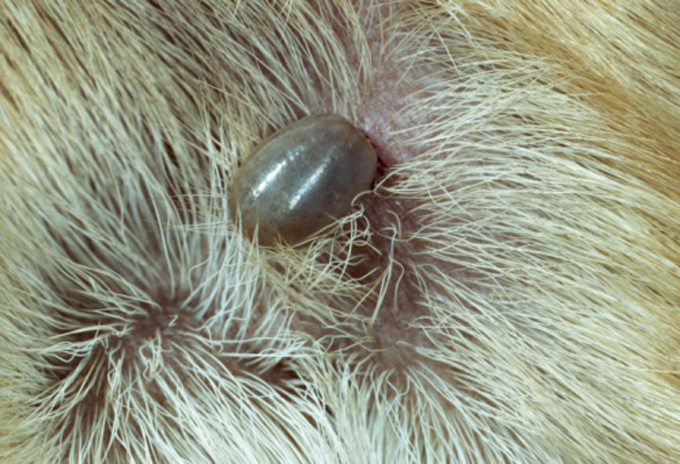 Paw pads, in and behind ears, around the neck, under the collar,"arm pits" and, scrotum/rectal area are all great places for ticks to be on a dog. They like warm, dark, moist areas of the animal best. Of course one can be anywhere on the dog but, those places are where they usually attach to the dog. Makayla - when is fall foliage season up your way? Thinking of a foliage trip sometime this fall. Subject: Re: Going to call him "Max the Tick Magnet" from now on.